Do you hear about the drone fighter MQ-9? Well, this aircraft is designed according to MQ-9 real plane-with super cool white appearance. It has the function of up/down, forward/backward, turn left/right, 3D flip. And flying weight is 67g. The rudder volume size is adjustable, and you can do 360-degree rotation by operating your up/down stick. 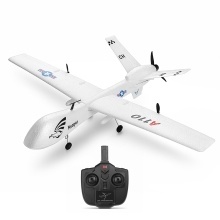 Anyway it&apos;s a good fixed wing toy for both kids and adult! Designed according to MQ-9 real plane, with cool white appearance.